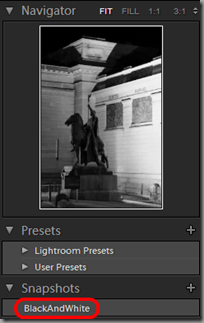 Lightroom’s snapshot feature is a great way to create a permanent record of the current develop settings for an image. You can record multiple snapshots against a single image, storing the different interpretations you made while developing it and allowing them to be recalled at the click of a mouse. These snapshots are accessible in both Lightroom’s Develop module and Photoshop’s Camera Raw plugin making it a powerful and efficient way to communicate settings between the two tools. 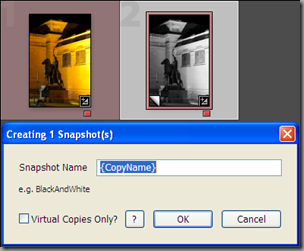 Converting virtual copies back to snapshots so all interpretations of the master image are stored in a way accessible from Photoshop. Personally I create virtual copies (VCs) to experiment with different image develop settings and then compare the results side by side. Once I’ve chosen the best I’ll create snapshots for each of the VCs worth keeping, then delete the VCs, because all of those snapshots are actually stored against the master image so will not be deleted. This is also a great approach for dealing with multiple crop sizes for the same image. My family have three different sized digital photo frames in use and converting VCs to snapshots is a great way to ensure this doesn’t clog my catalog with more thumbnails than truly necessary. that will be replaced with the relevant metadata from each image. Information about how this and the other elements of the dialog operate are described in the online help accessible using the button labelled with a question mark (?). Please leave a comment below to let us know how you use Lightroom’s snapshot feature, and how the Snapshotter plugin helps this or could be improved to help it more. Released as "donationware". If you use this plugin a donation via this page or the plugin entry in Lightroom’s Plugin Manager would be appreciated. Requires Lightroom version 3 or greater. Installation instructions here. Juste a remark after a quick test : I think memorizing “CopyName” (Copier 1, Copier 2…) is a very good thing for virtual copies, but “CopyName” appears as such when it is not a virtual copy (rather than just blank or “Main” for example). May be because it’a a french version of Lightroom ? @Polglch, I’ve just published a new version of the plugin in the last couple of days. It resolves the problem you mention and adds many more tokens that can be used when creating snapshot names. I haven’t updated this page yet (will happen soon) to reflect the changes, but if you download and install the new version the tokens popup menu and help will tell you all you need to know.